This morning Tisdale glistened with a brilliant clear blue sky and perfect summer temperature. 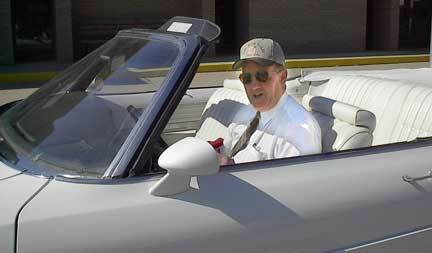 Just after 9:00 Ron Bowditch rolled up to the post office in his 1975 Oldsmobile convertible. 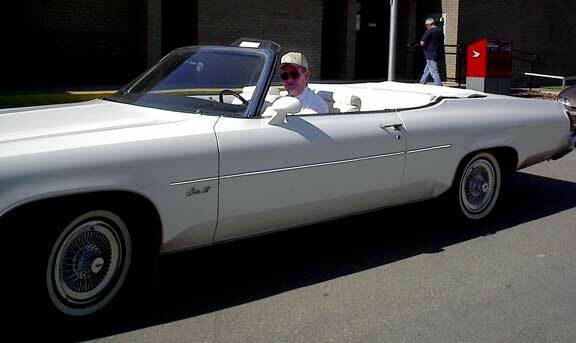 Decades ago every guy and perhaps every girl considered the ultimate car on the ultimate day to be a white convertible. I remember a friend explaining why he had ordered a 1964 Chevy Convertible as his very first car. He said it simply attracted girls. Puzzled by his comments he was already engaged when it took almost a year later for the ordered car to arrive. There have been many Saskatchewan summers when there may have been less than a couple of convertible days just like there have been many winters when the skidoo sat on its trailer all winter long. But cars and toys are not rational purchases they are luxury items that people dream about and sometimes buy to live out their dreams. After all that is pretty much what life is about finding what you want and going after it. As the owner of Tisdale General Motors dealership Bow Mar Sales LTD, Ron really understands the lure of dreams when it comes to buying a car. But as a practical man who has spent most of his life making good crops Ron appreciates the spirit of the 1975 Olds, an affordable dream car.